Circus Legend, Equestrian Comedy Superstar, Teacher of Boxing Gags and Enjoyer of Chairs, Mr. Edwin "Poodles" Hanneford. An autographed photo of Prince Paul Alpert given to John Peters in 1963. 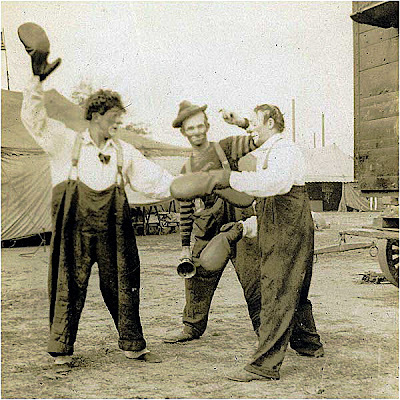 Correct me if I'm wrong here but, if I'm not mistaken, this is a photo of Poodles Hanneford (in his prime) and a young Otto Griebling performing the Boxing Gag!?! Otto learned the Boxing Gag from Poodles? Anyone have more information on this? Ringling Golden Age superstar Paul Jung works his special brand of magic and entertaining the offspring of a couple of Hollywood also-rans. I am working to restore my YouTube account and hope to have all of the videos back up and available soon. 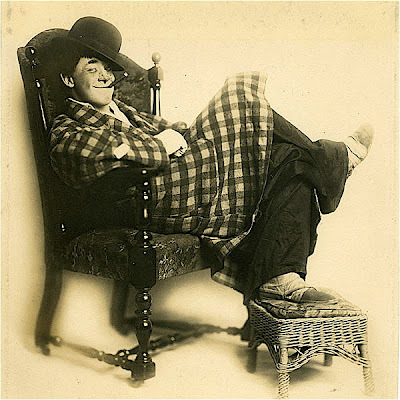 Dean "Elmo Gibb" Chambers, a recent star of the Kimtom International Clown Festival in Shanghai, China, taken on the Clyde Beatty-Cole Bros. 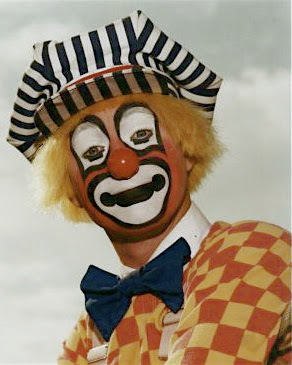 Circus in 1985. 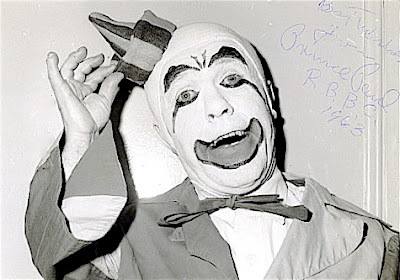 Lou Jacobs in an adaption of the mysterious whiteface that Felix Adler and Gijon Polidor also donned for Ringling PR during the same era, from the 1948 Ringling Bros. and Barnum & Bailey press book. 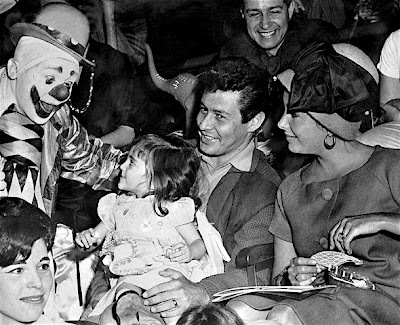 For some reason I don't think "Clowns Are Still the Backbone of the Greatest Show on Earth" will be an article in the 2008 Ringling press book. My pal, ICHOF inductee Mr. Billy Baker. Billy ends his wildly successful run at the Comedy Barn in Pigeon Forge, TN at the end of January and plans are afoot to produce a brand new Elwood Smooch revue (with a full 14 person cast). More details to be announced here soon! Violin in hand and "Little Tisch" lean shoes on his feet: Wilbur Hall in the film THE KING OF JAZZ (1930). KING OF JAZZ is a musical, filmed in early Technicolor, that preserves a part of America’s musical heritage that few people today know ever existed. The film has no plot, but consists of a series of extraordinary production numbers all directed by John Murray Anderson with the music supplied by Paul Whiteman, "the King of Jazz," and his orchestra. Whiteman, unknown now to all but specialists, had a musical career that ran from before World War I into the early sixties. His band was one of the most successful in history – their first hit, "Whispering," sold two million copies in 1920, about one for every record player in the country. It was the first of more than 20 number-one hits that the band would record in the twenties. However, Whiteman made his greatest contribution to American music in 1924, when he commissioned and then premiered George Gershwin’s "Rhapsody in Blue." For more on the film please click the title of this post. Wilbur Hall many years later performing on Spike Jones' show. I enjoyed just watching how much Spike and Freddie Morgan enjoyed the performance! Igudesman & Joo, a contemporary musical comedy duo that pays tribute to the style of Wilbur Hall in their show.